This article reports the current trends in timing solutions (timing devices and frequency control circuits) for modern electronic and communication systems, including the transition from discrete frequency sources to integrated circuits. Solutions that are gaining more popularity such as MEMS and tunable active inductor oscillators (TAIO) are described for completeness. The aim is to explore trends in market demands, competing technologies and the considerations of cost, size and performance (i.e. power-consumption, thermal drifts, phase noise, jitter, short-term stability, startup time, long-term stability and aging). Current versions of handsets do not seem to be getting smaller as they are already quite small. In fact, some handsets are becoming bigger to accommodate more functions desired by consumers, such as DSC, DVC, MP3, GPS, Internet access, Bluetooth, DTV, etc. Opposite to the earlier thought that fewer piezoelectric frequency control components would be needed as time progressed, handsets nowadays have many more of them, including quartz tuning forks, quartz crystals, crystal oscillators (XO), voltage-controlled crystal oscillators (VCXO), temperature-compensated crystal oscillators (TCXO) and RF SAW/FBAR filter/duplexers. However, downtrends in the economy have forced the entire electronic industry, including manufacturers of frequency generating devices to be more competitive. As conventional frequency controlled circuits and timing devices based on high Q resonators such as quartz, ceramic and SAW fail to follow economies of scale, the industry has begun looking toward alternative technologies. Growth in consumer products operating at high-frequencies is also driving the strong demand for "silicon resonator"-based oscillators and VCOs. CMOS resonators are a breakthrough technology that could replace ceramic and SAW resonator-based frequency controlled circuits operating at 500 MHz and above because they offer significant advantages in total manufacturing capacity and lower cost. CMOS resonators are just beginning the learning curve, and are expected to follow Moore’s Law on future size and cost reductions. CMOS resonators also offer a path towards IC integration, which is not possible with non-CMOS products. Silicon MEMS resonator oscillators are another potential big player in an integrated solution. Although still in its infancy, MEMS technology offers low cost and higher integration over a non-silicon quartz resonator operating at less than 200 MHz. They target applications where the size and degree of integration are key, leading to the ultimate usage of MEMS oscillators in almost all portable systems such as PDAs, camcorders and MP3 players. The potential for smaller footprint components and resistance to electromagnetic interference also supports new cell phone designs. Moreover, MEMS oscillators can meet price points set by crystal oscillators by leveraging established high-volume silicon manufacturing processes. A noticeable marketing push for all-silicon MEMS resonators and oscillators has re-ignited the interest in displacing quartz crystal technology in order to support the prospect of clock source integration. MEMS oscillators appear well suited to high-vibration environments, non-critically-timed applications and applications where the signal-to-noise ratios are not critical. MEMS devices, unlike ICs, contain moving fragile parts that must be properly packaged and meet the requirements such as protection against handling, shielding against electromagnetic fields, near hermetic cavity seal, low temperature process, good heat-exchange, minimal thermal stress, and RF electrical feed through before becoming commercially viable alternatives. As the handset market continues to grow, developing MEMS-based RF components such as switches, filters, resonators, oscillators, VCOs, etc. in the RF section of handsets seems to be the logical route toward integration. The accuracy of frequency generating devices for timing solutions depends on phase noise, thermal drift, harmonics, tuning sensitivity, stability, aging, etc. Crystals, SAW, ceramic resonator oscillators, RC oscillators and silicon resonator oscillators are the four main types of clock sources for use with a microcontroller. From simple RC oscillators, accurate to about 30,000 ppm, to atomic clocks, with accuracies of greater than 0.001 ppb, there are clocking options to meet the needs of every application. For years, bulk acoustic wave (BAW) crystal oscillators satisfied the majority of requirements, providing accuracies in the 10 ppm range. Less accurate options, such as surface acoustic wave (SAW) oscillators, ceramic resonator oscillators and IC oscillators, each have advantages to meet specific needs. While many characteristics define the performance of the frequency generating device, phase noise is the most important parameter for any timing solution. Quartz-based devices have long been a standard by which most other timing devices are compared. The history of quartz as a stable, controllable, high-quality material for frequency selective and clocking devices is universally recognized, and frequency vs. temperature response, aging, and jitter and phase noise characteristics are well chronicled. The majority of frequency control and timing products in the market are based on resonators, such as quartz crystal and ceramics. In earlier days, a typical GSM handset had four different sets of piezoelectric frequency control components, namely the RF SAW filter (~900 MHz to 2 GHz using piezoelectric lithium tantalate or lithium niobate) for transmission and receiver filtering between the antenna and the transceiver chipset; IF SAW filter (~50 to 400 MHz using mainly quartz) if super heterodyne down conversion was used; TCXO (13/26 MHz using quartz crystal) as a clock reference in the transceiver synthesizer for channelization; and a tuning fork (32.768 KHz using quartz crystal) for standby clocking in the baseband section (215 = 32768). Later on, the successful development of direct conversion technology made the IF SAW filter obsolete in many GSM handsets (see Figure 1), and GSM transceiver chipsets with an on-chip digitally-compensated crystal oscillator (DCXO) circuit began to appear.1 The TCXO was no longer needed to pair with these transceiver chipsets. However, an off-chip quartz crystal was still needed (see Figure 2). Table 1 describes the typical crystal and SAW-based products for frequency control circuits and timing devices. Designers and manufacturers have been able to pursue new applications, thanks to some recent developments in oscillator technology. These include configurable oscillator technology, which makes the delivery of oscillators and VCXOs more timely and affordable than ever before. This type of oscillator remains extremely competitive with its MEMS and SAW oscillator counterparts in terms of cost, performance and delivery times. What sets configurable crystal oscillator technology apart is its ability to deliver its technical and business advantages across a frequency range of 750 kHz to 1.35 GHz with low jitter (less than 1 ps) and phase noise characteristics comparable to conventional crystal oscillators and SAW oscillators, as well as jitter and phase noise characteristics better than MEMS oscillators. Designers of subscriber applications such as wireless WiMAX or WiBRO data networks find this combination particularly attractive. This customizable technology also enables new crystal oscillators to find homes as diverse as the clock source in 10G Ethernet, optical networks, storage-area networks (SAN), FPGAs, ADSL and many other applications. The demand for quartz crystals and crystal oscillators had been increasing steadily between 4 to 10 percent annually since the beginning of the decade, but was restricted to frequencies below 200 MHz. 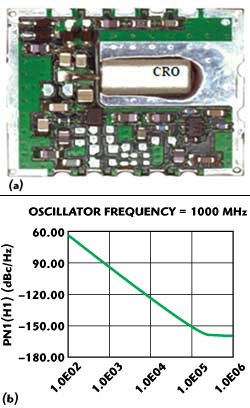 Recent downtrends in the telecom market caused a 50 to 80 percent drop in revenues as the business strategies of many crystal oscillator manufacturers were tied to mostly servicing telecom giants with their mid- to high-end quartz crystals and crystal oscillators (HFF inverted mesa crystal, XO, VCXO/VCSO, TCXO, OCXO and timing module). Now that the telecom quartz crystal and crystal oscillator market is showing signs of recovery, many more crystal oscillator suppliers are investing in developing mid- to high-end crystals and crystal oscillators to prepare for the telecom market return. Suppliers who suffered during the downturn will be glad to see the market rebound, but they will find more competitors out there and telecom customers demanding lower prices. Despite quartz being the material of choice for high performance TCXOs, there are several drawbacks and limitations. The first difficulty is related to the attachment of miniaturized quartz plates to the ceramic package with solder balls. Precise control during assembly is crucial to preventing spurious modes and packaging related stresses that can impact the temperature stability of the quartz resonator. Secondly, the quartz is a fragile material. Handset manufacturers have moved towards smaller packages, leading to the use of smaller quartz plates and making the absolute manufacturing tolerances more challenging. Figure 3 A typical inverted high frequency mesa. It has long been a research activity to produce a low cost high frequency fundamental crystal resonator in the GHz range. One possible solution has been the development of the inverted mesa-type crystal resonator.3 As shown in Figure 3, the center portion of the mesa quartz resonator is comparatively thinner than the outer ring, so that the center ring vibrates at higher frequency without breaking. The outer thicker ring forms a strong frame structure around the thin and fragile, etched central resonating structure, which is etched to the thickness corresponding to the operating frequency. The strong outer ring enables easier handling. This technique allows the manufacture of very thin quartz crystals resonators, but needs lot of effort and is therefore not an economically viable solution at the moment. As ICs continue to shrink, resonators based on non-silicon technology unfortunately do not follow Moore’s Law for miniaturization. Ultimately, this restricts further reductions in the footprint of IC/quartz, ceramic, or SAW hybrid timing solutions. Additionally, quartz crystal, ceramic and SAW devices are produced through fairly labor intensive processes, wherein each device has to be finely tuned to achieve the desired resonant frequency characteristics, further adding to their overall cost and making the replacement of these devices with an monolithic IC solution all the more attractive. RF system designers also stress the need for higher levels of integration in RF function blocks, an approach that is amenable to RF and digital interfaces, and therefore speeds the time to market while simplifying system-level integration. Figure 4 A typical matrix of MEMS resonators and their mode shapes. With the advent of MEMS technology, there has been an ongoing debate whether MEMS resonators could offer a competitive alternative to quartz crystal resonators. In particular, as the integration difficulties of the quartz crystal with the oscillator IC scale inversely with the size of the package, the use of MEMS resonators would promote a monolithic solution of MEMS and IC. Commercially available MEMS oscillators targeting low-end timing solutions still struggle for general acceptance as a replacement of TCXO because current MEMS oscillators fail to achieve the combination of temperature stability, low phase noise and frequency accuracy. Figure 6 Typical quartz and MEMS oscillator. In order to adapt to the highly competitive IC market, chip suppliers are racing to reduce the total chip count by integrating functionality onto a single IC. However, one of the few elements that escaped this integration and remains to be off-chip is the timing source. In both wireless and wired systems, the reference source requires varying degrees of accuracy and stability over time and temperature. More often these accuracy requirements can only be met by using externally compensated reference sources such as TCXOs or VCXOs, which occupy a large fraction of the board space. Hence, a large emphasis is placed on eliminating these components by either integrating their functionality on-chip or replacing them with a much smaller footprint solution. The quartz crystal oscillator XO has been the de facto frequency source in electronic platforms for nearly 100 years. Through precise manufacturing and economic scale, XOs have proven to be stable and low-cost frequency sources. However, XOs are referenced to macroscopic crystals (XTAL), which are not able to be integrated, thus often limiting device form-factor. Furthermore, fundamental-mode XTALs scale only to modest frequencies. The following section looks at crystal oscillator technologies. There are three groups of solutions with different performances. The first group consists of the pairing of either a high frequency fundamental (HFF) quartz crystal, a 3rd overtone (OT) quartz crystal, or a fundamental SAW resonator with a traditional feedback loop oscillator IC. The second group pairs a low frequency quartz crystal (20 to 35 MHz) with a simple divider PLL IC. The third group consists of the pairing of a 3rd OT quartz crystal with a higher level PLL IC, e.g. a 3rd OT quartz crystal with an analog frequency multiplier™ (AFM, e.g. x 2) IC, a 3rd OT quartz crystal with a fully programmable DSPLL oscillator IC.2-4 The above solutions offer less than 1 ps rms phase jitter (12 kHz to 20 MHz). Except for the SAW solution, the above solutions offer typical AT-cut quartz crystal’s cubic frequency-temperature property and ±100, 50 and 25 ppm options are available. Figure 7 Measured phase noise plots of XOs. Crystal oscillators using additional temperature compensation, also referred to as a temperature compensated crystal oscillator (TCXO), are able to achieve typical frequency stabilities of ±2.5 ppm/year at room temperature, typical phase noise of -138 dBc/Hz at 1 kHz offset and power consumption as low as 1.5 mA. The smallest commercial TCXOs are currently available with dimensions of 2.0 x 1.6 x 0.8 mm.5 Figure 7 shows the phase noise plot of a differential coupled 100 MHz crystal oscillator (XO). As shown in the figure, the mode-feedback technique minimizes the phase noise by 10 to 15 dB, resulting in a cost-effective solution. The typical measured phase noise is -139 dBc/Hz at 100 Hz offset from the carrier; this is a reasonably low phase noise for this class of inexpensive crystal resonator oscillators. Ceramic coaxial resonator oscillators (CRO) are widely used in wireless applications, since the technology features low phase noise and high quality factor (Q), at fixed frequencies through about 4000 MHz. Typically, a ceramic resonator is comprised of a dielectric material formed into a rectangle prism with a coaxial hole running lengthwise through the prism and an electrical connector at one end. The outer and inner surfaces of the prism, with the exception of the end connected to the electrical connector and possibly the opposite end, are coated with a metal such as copper or silver. A device formed in this manner forms a resonant RF circuit, including capacitance, inductance and loss resistance that oscillates in the transverse electromagnetic (TEM) mode, if loss resistance is compensated. Unfortunately, CROs have several disadvantages, including a limited temperature range, limited tuning range and sensitivity to phase hits (due to the different rates of expansion/contraction by the outer metallic body of the coaxial ceramic resonator and other components of the oscillator circuit over temperature). A designer can consider using a digitally implemented CRO to overcome the above problems; however, due diligence must be done upfront in order to avoid the large phase hits that can unlock a communication link if not adequately absorbed. Figure 8 Layout of 1 GHz CRO6 (a); simulated phase noise plot of 1 GHz CRO (b). Figure 8 shows the layout and phase noise plots of a 1 GHz CRO; the typical phase noise at 10 kHz offset is -125 dBc/Hz. CROs are generally used for less accurate applications.6 Initial accuracy (calibration) of these devices ranges from ±0.05 percent to ±1.0 percent. Temperature stability is approximately 15 ppm/°C for ceramic resonators. Aging is in the range of ±0.5 percent/10 years. These devices have a much lower Q than quartz crystals and also seem to be more prone to spurious modes of operation. The bulk of the quartz is the area of excitation for the previously mentioned crystals (BAW). SAW devices are generally used in frequency ranges above those targeted with BAW crystals. The SAW involves only the surface of the substrate. The frequency is set by the distance between the electrode "fingers". Quartz, LiTaO3 and LiNbO3 are common substrates for such devices. Initial accuracy is dependent on the accuracy of the printing of the "fingers", ranging in the ±50 to 200 ppm range. The approximate temperature constant of quartz is 0.03 ppm/°C and -20 ppm/°C for LiTaO3.2 Upper frequencies of 3.5 GHz are currently obtainable. The lower end is limited primarily by size, since the AT becomes more practical. Currently, SAW resonator oscillators are used for high frequency signal sources where frequency stability is especially important. The shift to multi-band, multimode phone models has increased the number of SAW filters per handset. As more phones operate over multiple bands, manufacturers are expected to require more SAW filters, thereby increasing the overall SAW filter market size, specifically SAW filters, resonators and oscillators. SAW oscillators are widely used in wireless applications, since the technology features very low phase noise at fixed frequencies up to about 3 GHz. SAW resonator oscillators are also known for their low micro-phonic noise (tolerance to vibration), high Q and low jitter. Unfortunately, SAW oscillators have several disadvantages, including a limited operating temperature range and tuning range (which limits the amount of correction that can be made to compensate for the tolerances of other components in the oscillator circuitry). In addition, since the design of a new SAW oscillator is much like that of an integrated circuit (IC), development of an oscillator with a nonstandard frequency requires NRE costs on the order of $10,000, in addition to the costs of the oscillators. Figure 9 Measured phase noise plot of 1 GHz VCSO. Synergy Microwave has developed a low-cost ultra low phase noise SAW VCO that offers improved thermal-drift and phase noise performance compared to other commercially available SAW oscillators at comparable frequencies. Figure 9 shows the phase noise plot of the 1 GHz SAW oscillators; the typical phase noise at 10 kHz offset is -152 dBc/Hz. These SAW devices are available in standard frequencies, such as 622.08, 800, 915.5 and 1000.01 MHz, as well as in customer-specified frequencies from 300 MHz to 4 GHz. Ultra-low phase noise VCSOs offer significant promise in terms of performance, price and product delivery. Until now, MEMS oscillators had taken only limited advantage of MEMS integration. The market for such devices is obvious when one looks at existing timing solutions, currently consisting of a large socket on which a PLL ASIC is placed to a discrete, bulky quartz sensor. MEMS oscillators offer the same functionality as a one-chip solution and now compete directly with products that have temperature stability of about 50 ppm. Regarding the 10 ppm temperature stability, this is good, as MEMS oscillators had offered 25 to 50 ppm so far. It is not clear, however, if there is a market for this specific temperature stability range. Most consumer and IT applications can work with 30 to 100 ppm, on the higher side, and TCXO for mobile phones and GPS require 0.5 to 2 ppm. A recent publication reports a temperature compensated MEMS oscillator (TCMO™) with 5 ppm over the temperature range from -40° to +85°C and phase noise performance of -136 dBc/Hz at 1 kHz offset from the 13 MHz carrier.5 Although the technology offers a cost-effective solution, the phase and frequency discontinuity deteriorates the jitter, resulting in sudden jumps in phase that plague commercially available fractional N-PLL-based designs. The small size and rugged reliability that MEMS oscillators can offer are an important part of the future of the frequency control market. The MEMS-based oscillator addresses a strong need for high-shock resistant timing components in the Precision Guided Munitions (PGM) markets. The relatively recent introduction of MEMS-based oscillators has been accompanied by claims that this technology would finally replace quartz by providing lower costs, shorter design and production cycle times, excellent shock and vibration performance, and superior signal quality. Despite these claims, few studies have been available to help understand the performance characteristics of MEMS oscillators. Due to their material characteristics, silicon-based MEMS oscillators have to use a temperature compensated circuit to tune the resonant frequency back to an acceptable scale. The vibration mechanism of the silicon MEMS resonator is still not very stable in the short term and that makes the MEMS oscillator unable to achieve wide market acceptance at this time. Another new technology that is a suitable alternative for cost-effective integration is the tunable active inductor oscillator (TAIO). TAIO technology, by virtue of its small size, is extremely rugged and well-suited to low-jitter applications such as in military and aerospace equipment, where resistance to shock and vibration is at a premium. Exciting new devices exist for active tunable inductors in areas such as tunable oscillators, filters and resonators. Figure 10 A typical equivalent representation of gyrator-based active inductor. The typical active inductor is based on a gyrator (see Figure 10), which can be realized by connecting an inverting amplifier to a non-inverting one in parallel and back-to-back. Care must be taken to avoid encircling and crossing the impedance at 4.3 GHz (see Figure 11, point #3), which limits certain applications.20 Several approaches to overcome these problems have been considered, including the minimization of the noise introduced by the active devices that make up the ATI circuits. However, these techniques can be power hungry and result in limited band characteristics. Technologies for creating frequency synthesizers are diverse, from traditional analog methods using PLLs to direct digital synthesizers (DDS) that rely on high-speed digital-to-analog converters (DAC). Frequency synthesizers can be categorized into mainly three groups: analogue, digital or mixed signal (hybrid). The frequency synthesizer described in Figure 12 falls into the hybrid category. A typical unit tunes from 500 to 1000/1000 to 2000/2000 to 4000/4000 to 8000 MHz in 1 MHz steps with settling time of less than 4 ms and typical phase noise of -108 dBc/Hz at 100 kHz offset from the carrier. Figure 12 Block diagram of a configurable synthesizer using configurable TAIOs. Developing RF circuits and subsystems require a series of engineering trade-offs that are limited by the technology currently in use.21 This is "easy" to deal with for single-mode systems like an old-fashioned cell phone, or modern Bluetooth circuit, but gets harder to do as frequencies get higher, data bandwidth gets larger, and most of all, when multiple broadband signals have to be managed in the same device. This is a defining trend in the wireless industry, and one that is taxing the limits of conventional technologies and "old-school" radio architectures. Wireless engineers in the broadband, multi-standard world need a better way of doing things, and better technologies that can easily handle these widely varying signals. Essentially, RF MEMS devices offer "best of breed" in a host of performance and usage parameters out of all possible technologies considered to be an alternative for a very wide variety of RF applications. The most widely recognized advantages are low loss, high isolation, near-perfect linearity, and unbelievable large instantaneous bandwidth that conventional mechanical and semiconductor technology simply cannot compete with. On top of this are a host of usage parameters like cost, size, speed, ruggedness, reliability, repeatability and lifetime, that each range from fantastic to poor depending specifically on what they are being compared to and depending on whether or not a customer values that particular specification. RF MEMS came into their own as a nascent industry in the early ’90s, which is when most of the classic devices were invented by researchers working for major defense-oriented companies. These device-level development efforts were largely funded by DARPA and the Air Force, with a system-level view of how these devices could actually improve radar and communication systems. Soon after, other Federal services and agencies recognized their own needs for improved RF systems, and followed suit with programs directed towards broadband, highly multi-band, and/or millimeter-wave applications such as tactical radio programs (JTRS, WIN-T etc. ), satellite communications, and terrain-penetrating imaging radar (FOPEN, URPEN, etc.). RF MEMS enable switching and tuning of front-end circuits for applications of mode switching, antenna tuning and antenna beam steering with phase shifters. There are still significant obstacles for RF MEMS to enter conservative application areas with long histories of well-established technologies and very strict screening requirements. There are a number of challenges that face anyone who wishes to take an RF MEMS device or circuit prototype into component production. The most significant challenges are those associated with packaging. These packaging aspects are designed to enable the high RF performance of the MEMS devices inside to shine, yet still provide customer-demanded levels of four critical operational characteristics: lifetime, repeatability, reliability and ruggedness. While integrated silicon solutions are cost-effective and compact in size, they leave much to be desired in comparison to the performance of non-silicon resonator-based oscillators. The recent strong marketing push of the MEMS silicon resonator-based oscillators seems to have re-ignited the interest in displacing quartz crystal technology and once again open up the prospect of clock source integration. However, the risk factors are alarming for the application of ultra stable and ultra low phase noise frequency generating circuits and timing devices, since optimization (stability, jitter, thermal drift, reliability) and changes during the IC design phase can be expensive and time consuming. There is a dynamic market for frequency control devices, including quartz crystals and oscillators, SAW devices, ceramic resonators, and the evolving market for MEMS and TAI oscillators. With today’s new business model, a company no longer focuses on individual technology such as MEMS and LC oscillators, but instead sells IP that supports the design and manufacture of integrated MEMS devices (probably focused on SiGe). Technology breaks in R&D include resonators, temperature sensors, pressure sensors and inertial sensors. Indeed, there are only a few companies with advanced development of MEMS oscillators as well as a larger group in the quartz and timing industry that are interested in adding this technology to their portfolio. Competition from silicon MEMS, SAW and other oscillators has made crystal oscillators better than ever. How will market trends for frequency controlled circuits and timing devices shape up? While silicon-based timing devices are still not as capable of sophisticated tasks as crystal oscillators, they are getting better, and will eventually replace crystals in many contexts. That will produce further synergies for the industry as mass production becomes cheaper and easier. These days, designers require higher frequencies and low jitter in oscillators, while buyers demand low cost and quick delivery. Timely oscillator options that can deliver the highest desired performance, while minimally compensating design steps are key to cost-effective solutions. Fortunately, in the ongoing battle to push the limits of technology and lower component costs, oscillator manufacturers continue to close the gap between high-level performance and cost-effective purchasing, with conventional crystal technology paired with configurable oscillator technology. Like every exciting new technology targeting mass markets and driven by start-ups, confusion or exaggeration are present, but all in all, it is believed that MEMS oscillators will follow the successful bulk acoustic wave devices as the second RF MEMS mass product. If SiTime Corp., an analog semiconductor company focused on MEMS-based timing solutions, keeps to schedule and ships its first million devices by year’s end, a major step will have been taken towards a bright future. As Senior Analyst for ABI Research, Doug McEuen stated, "The current steady, moderate growth in timing solutions revenue is being driven by the expansion of strong consumer electronics and computer applications sectors, and because silicon timing solutions are improving. Silicon is increasingly able to handle some of the timing tasks traditionally given to crystals. However, continued under-investment by telecom infrastructure vendors could have a negative effect in the medium term." Overall, it is expected that the market for both non-silicon and silicon resonator oscillators will share 50 percent of the timing solution market down the road. C.S. 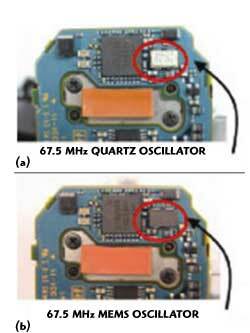 Lam, "A Review of the Recent Development of MEMS and Crystal Oscillators and Their Impacts on the Frequency Control Products Industry," 2008 IEEE International Ultrasonics Symposium Proceedings, pp. 694-704. "NXP Aero® Quad-band GSM/GPRS/EDGE Radio Front-ends AERO42xx," http://www.nxp.com/acrobat_download/literature/9397/75015986.pdf. M. Umeki, T. Sato, H. Uehara and M. Okazaki, "622 MHz High Frequency Fundamental Composite Crystal Resonator with an Air-gapped Electrode," 2004 IEEE International Ultrasonics, Ferroelectrics and Frequency Control Joint 50th Anniversary Conference, pp. 365-368. "Analog Frequency Multiplier," Phaselink, http://www.phaselink.com/whitepaper/AFM-wp.pdf. K.J. Schopef, et al., "TCMTOTM: A Versatile MEMS Oscillator Timing Platform," 41st Annual Precise Time and Time Interval Meeting, November 2009. U.L. Rohde, A.K. Poddar and G. Boeck, Modern Microwave Oscillators for Wireless Applications: Theory and Optimization, Wiley, NY, NY, 2005, pp. 232-240. U.L. Rohde and A.K. Poddar, "Wideband Voltage-controlled Oscillators Employing Evanescent Mode Coupled Resonators," US Patent No. 71803812, February 2007. U.L. Rohde, A.K. Poddar and R. Rebel, "Integrated Low Noise Microwave Wideband Push-Push VCO," US Patent No. 7,088189, August 2006. U.L. Rohde and A.K. Poddar, "User-definable Thermal Drift Voltage-controlled Oscillator," US Patent No. 7, 265,642 B2, September 4, 2007. U.L. Rohde and A.K. Poddar, "Low Thermal Drift Tunable Frequency Voltage-controlled Oscillatory," US Patent No. 7, 262,670 B2, August 28, 2007. U.L. Rohde and A.K. Poddar," Tunable Oscillator," US Patent No. 7, 292,113, November 6, 2007. U.L. Rohde and A.K. Poddar, "Tunable Frequency, Low Phase Noise and Low Thermal Drift Oscillator," US Patent No. 7196591, March 2007. U.L. Rohde and A.K. Poddar, "Multi-octave Band Tunable Coupled-resonator Oscillator," US Patent No. 292,113, November 6, 2007. U.L. Rohde and A.K. Poddar, "Low Noise, Hybrid Tuned Wideband Voltage-controlled Oscillator," US Patent No. 7,365,612 B2, April 29, 2008. U.L. Rohde and A.K. Poddar, "Tunable Frequency, Low Phase Noise and Low Thermal Drift Oscillator," US Patent No. 7, 545, 229, June 9, 2009. U.L. Rohde and A.K. Poddar, "User-definable, Low Cost, Low Phase Hit and Spectral Pure Tunable Oscillator," US Patent No. 7,586,381, September 8, 2009. U.L. Rohde and A.K. Poddar, "User-definable, Low Cost, Low Noise and Phase Hit Insensitive Multi-octave-band Tunable Oscillator, Phase Hit and Spectral Pure Tunable Oscillator," US Patent No. 7,605,670, October 20, 2009. 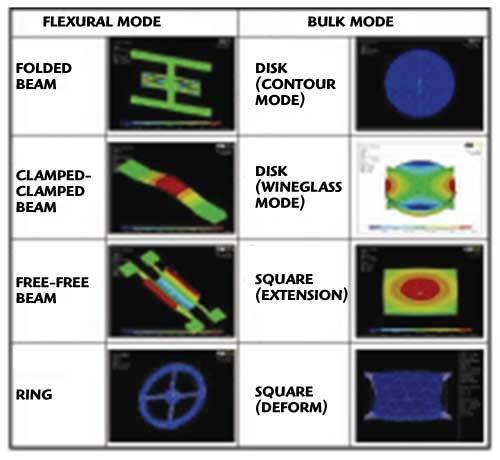 R. Gaddi, A. Gnudi, E. Franchi, D. Guermandi, P. Tortori, B. Margesin and F. Giacomozzi, "Reconfigurable MEMS-enabled LC-tank Multi-band CMOS Oscillator," IEEE MTT-S, 2005. C.T.C. Nguyen, "RF MEMS in Wireless Architecture," Proc. Design Automation Conference, 2005, pp. 418-420. U.L. Rohde and A.K. Poddar, "Tunable Active Inductor Offers Integrable and Cost-effective Alternatives of Varactor Tuned VCOs," 2009 European Frequency & Time Forum & IEEE International Frequency Control Symposium (EFTF-IFCS 2009), Besançon, France, April 2009. U.L. Rohde and A.K. Poddar, "Frequency Generations and Synthesis: Cost-effective & Power-efficient Sol," Microwave Journal, Vol. 52, No. 5, May 2009, pp. 160-184. W. Thai and M. Pai, "The New Heart Beat of Electronics—Silicon MEMS Oscillators," 2007 Electronics Components and Technology Conference, pp. 1895-1899. C.T.C. Nguyen, "MEMS Technology for Timing and Frequency Control," IEEE Transactions on Ultrasonics, Ferroelectrics and Frequency Control, Vol. 54, No. 2, February 2007, pp. 251-270.